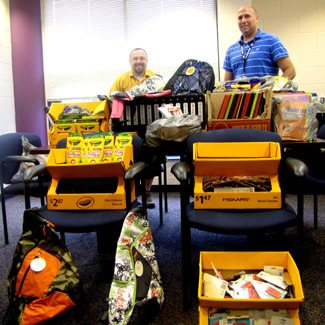 The campaign received at least $3,000 in money and supplies, enough to fully outfit 100 students with every school item the district had requested, plus hundreds of additional crayons, notebooks and pocket folders, officials said. William Meiser, the district’s director of operations and the campaign’s primary organizer, thanked all donors, but was particularly pleased with the donations from the local business community. Not a single business turned them down for a donation, he said. The Fill the Bus campaign took place over a two-week period during which a school bus was parked at different locations in the district. The campaign was completely staffed and run by volunteers, Bright said. Meiser hopes to make the event even bigger next year. In particular, he wants to work with Middletown Area High School’s student council to get students involved in providing donations.